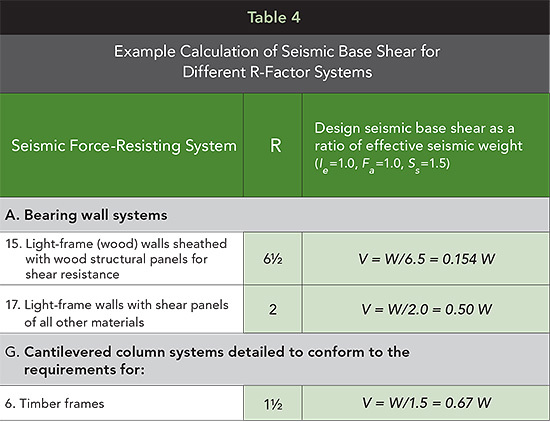 Example calculations of seismic base shear for wood-frame wood structural panel shear walls (A15), wood-frame shear walls with other sheathing materials (A17) and cantilevered column systems (G6) are summarized in Table 4. The seismic base shear calculation assumes all buildings are located at the same site with mapped values of Ss=1.0g, site coefficient=1.0 and Importance Factor, Ie=1.0. As would be expected, the A15 system employing wood-frame and wood structural panels (i.e., R=6.5) results in the lowest design seismic base shear equal to 0.154 W or approximately 15% of the effective seismic weight. In contrast, the A17 system employing wood-frame and shear panels of other materials (such as gypsum wallboard or structural fiberboard with R=2.0) results in design seismic base shear equal to 0.50 W or approximately 50% of the effective seismic weight. In lower seismic regions, the significance of lower R-factor systems is often negligible as requirements for wind design will produce greater design forces than even the lowest R-factor systems. In cases where seismic forces do govern design of shear walls, use of systems associated with larger values of design seismic base shear is generally associated with increased required lengths of shear walls for shear resistance, increased number and/or size of connections and anchorage to the foundation, and increased foundation size. ▶ This system includes shear panels of particleboard, structural fiberboard, gypsum wallboard, gypsum base for veneer plaster, water-resistant gypsum backing board, gypsum sheathing board, gypsum lath and plaster, and Portland cement plaster, or lumber sheathing with fastening and shear wall aspect ratio varying by shear panel type. ▶ All framing members and blocking used for shear wall construction are 2-in. nominal or greater. ▶ Foundation anchor bolts have a steel plate washer under each nut not less than 0.229 in. x 3 in. x 3 in. in size except in some cases where standard cut washers are explicitly permitted. ▶ Allowable unit shear strengths span a wide range across different sheathing materials. For 1/2-in. gypsum wallboard, allowable unit shear strengths range from 75 plf (sheathed on one side, unblocked panel edges, and 7-in. fastener spacing at panel edges) to 360 plf (sheathed on two sides, blocked panel edges, and 4-in. fastener spacing at panel edges). Particleboard, structural fiberboard, horizontal lumber and vertical board shear walls are permitted in seismic design categories A, B and C.
▶ Gypsum wallboard, gypsum base for veneer plaster, water-resistant gypsum backing board, gypsum sheathing board, gypsum lath and plaster, or Portland cement plaster, and diagonal lumber shear walls are permitted in seismic design categories A, B, C and D.